- with the idea of writing a neat product review type blog/article. I’ve failed miserably in that endeavor, as I know nothing about the game of indoor soccer or 5-a-side. Having no experts around either, I had to wing it. The good thing is that these shoes could be worn for anything and everything! As most of the shoes in the Indoor Soccer Shoes department. Therefore, if you’re looking for a deeply technical analysis from an experts’ POV, click away now. The following are my own thoughts and opinions on these stylishly colorful (colorfully stylish?) shoes plus a little piece on 5 a side. 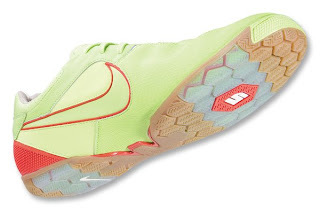 Some cool features are the scuff guard on the inner heel, where shoes tend to scratch the most; and a reflective plastic with Nike Zoom on the right side, to be seen in the dark. With the rising popularity of evening soccer the Nike Fives collection adds a new edge to football. These 5tastic! shoes offer you more choice to what’s out there for this ever growing sport. The Nike Fives range of footwear shoots to enhance speed, control, movement, strength and vision - all vital assets to any 5-a-side player. Five-a-side football is a variation of association football in which each team fields five players (four outfield players and a goalkeeper), rather than the usual eleven. Other differences from typical soccer include a smaller pitch, smaller goals, and a reduced game duration. Games are often played indoors. Additionally the ball is not allowed to go over "head height" or else the opposition is awarded an indirect free kick. The penalty area is also significantly different from regular football: it is semi-circular in shape and only the goalkeeper is allowed within it and he or she is not allowed out. There are normally no offside rules which means just one referee. No headers are allowed. Another rule in five-a-side football is that metal studded boots or blades cannot be worn, as it damages the playing surface. Powerleague and Goals Soccer Centres are the two big operators of 5 a side football in the UK. Five-a-side football leagues can be played on astroturfs across the United Kingdom. Five-a-side is commonly played informally, and the rules are therefore flexible and are sometimes decided immediately before play begins; this is in contrast to futsal where official laws are published by FIFA.